Dutchess County Executive Marc Molinaro hosted the 2nd Annual Agricultural Forum at the Dutchess County Fairgrounds yesterday where he was joined by members of the Agricultural Advisory Committee, which includes local farmers, elected officials, agricultural and land conservancy organizations and others, to discuss issues and policies regarding agriculture and agri-business. NYS Assemblymember Didi Barrett, NYS Senator Sue Serino, as well as Dutchess County Legislators Angela Flesland, Gregg Pulver and Sandy Washburn and Ben Traudt, Assistant to Dutchess County Legislature Chairman Dale Borchert, were all in attendance. Dutchess County Agriculture comprises over 170,000 acres (1/3 of the total acres), produces nearly $50 million in market value products, and is the county’s third largest employer. Agriculture also plays a huge role in the county’s $500+ million tourism industry. “Farming is a critical industry in Dutchess County, it is woven into our heritage and is critical to our future economic success. 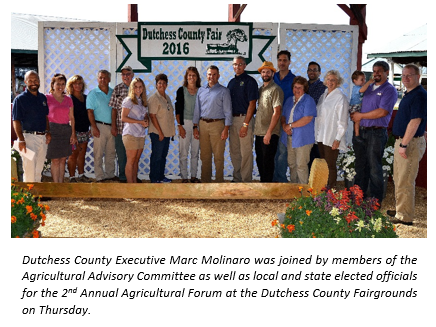 I am grateful for the work and dedication of those serving our Agricultural Advisory Committee, who are ensuring that we are addressing the needs of our local farmers to help them to continue to thrive,” said County Executive Molinaro. An update on farmland preservation was given at the forum as well. Nearly $1,000,000 in grant awards have been made in 2016 from Dutchess County’s Partnership of Manageable Growth (PMG) program, preserving more than 700 acres for six farms located in East Fishkill, Pleasant Valley, North East, Milan and Pine Plains. Total farmland acreage preserved through PMG funding totals nearly 3,300 acres. County Executive Molinaro announced his intent to request an additional $1 million dollars from the Dutchess County Legislature for the PMG program as part of the 2017 budget and a new round of applications for PMG funding will be opening in late September. The forum included a presentation from Jeff Williams, director of Division of Public Policy at the New York Farm Bureau, which included a discussion of regulatory threats for farmers as well as the debate among farmers on topics such as GMOs and pesticide use.